Scarecrows are scary, so we grabbed some sticks, an old coat, a hat and stuffed some hay into a feed sack. Finished it off with a ropey tie. Enter Arthur D. complete with a crow resting on his arm. He is apparently not very scary, so we can’t guarantee he will keep the marauders away. But he will be a cute addition to your autumn and Halloween decorating. And what do you need to complete the picture drawn by the lyrics at the top of the page? You guessed it – a cornfield, a grave and pumpkins. We also threw in some hay and a pitch fork. All for a nice low land impact of 5 PE. Both new products are currently on display at -Hanaya- in-world store and eligible for our VIP group store discount. 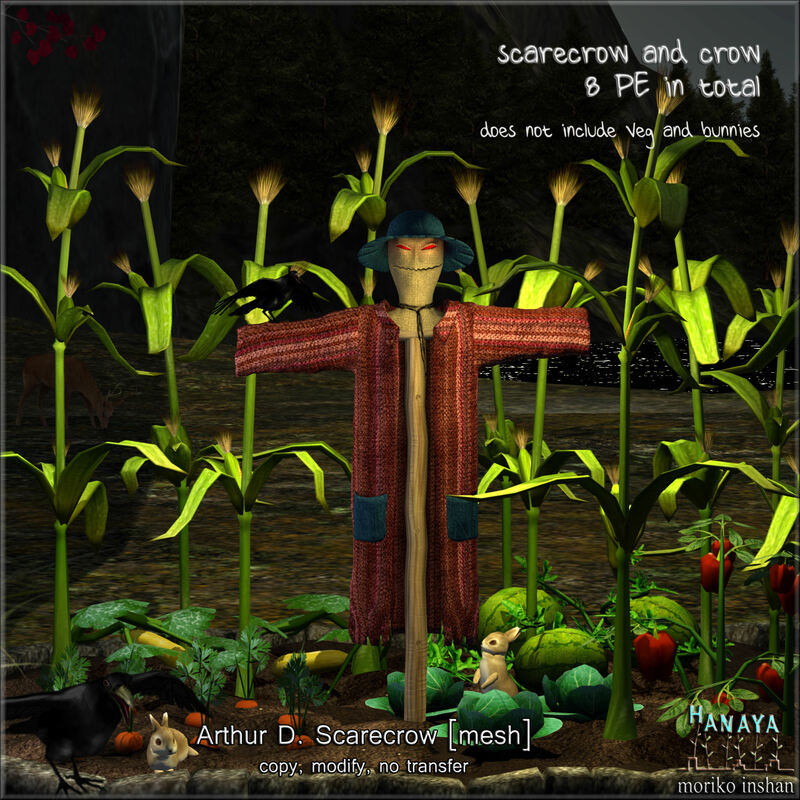 Also available on the Second Life Marketplace. This entry was posted in Product Announcements and tagged autumn, halloween, harvest on September 23, 2015 by moriko. In the middle of decorating our home sim for autumn, I got in the mood for you know .. scary things. Stuff that goes bump in the night. Halloweeny stuff … so. This little guy is sufficiently scary for my purposes and provides a bit of light on those dark, moody nights of autumn. 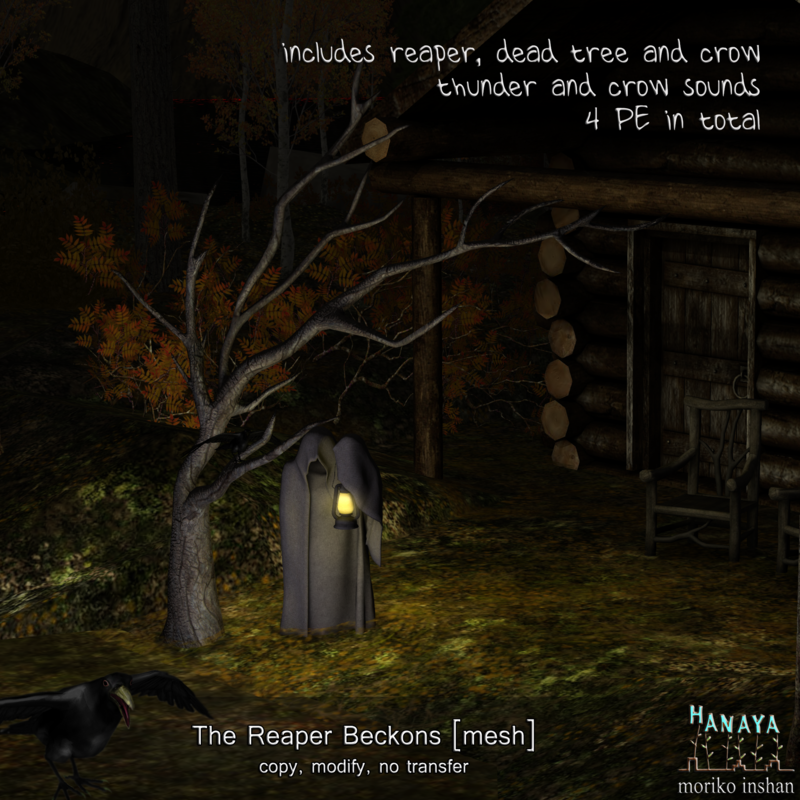 The set includes the reaper with lantern, a bare tree trunk and a black crow. Land impact of 4 PE for the whole set. Now on display at -Hanaya- in-world store and also available on the Second Life Marketplace. And groupies – don’t forget to wear your VIP group tag if you buy in-world for your 20% discount. This entry was posted in Product Announcements and tagged halloween on September 16, 2015 by moriko. After a lovely summer off, the -Hanaya- team is back with a group gift for our loyal customers. 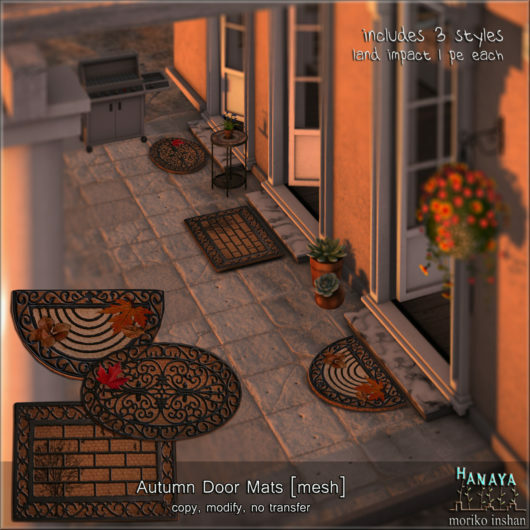 These cute little meshy door mats are provided in 3 types, and are only 1 LI each at provided size. Embellished with fallen autumn leaves, and featuring rubber over burlap, they will be sure to say ‘Welcome’ to your home in style. Either buy them from our in-store Mesh Products vendor, or grab a copy for free if you are a member of our store VIP group. Remember to wear your group tag! This entry was posted in Freebies and Gifts, Product Announcements on September 6, 2015 by moriko.